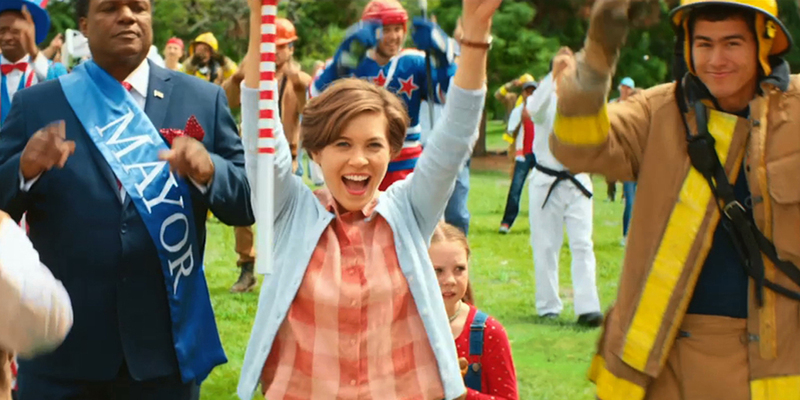 All the townspeople, and a monumental guest, turn out for Johnsonville’s Memorial Day ad. Tammy is the latest Johnsonville employee to contribute an idea for a commercial, and she is the go-big-or-go-home type. Starting with the timeless premise of a mom embarrassing her kid for asking a question (specifically, where Johnsonville sausage comes from), her concept expands into a Broadway-style ensemble piece with firemen, dozens of local dogs, the mayor, and the Statue of Liberty joining the mom in song. The final surprise appearance sparks a chorus of “heck yeah’s” from this PG-rated gathering. Her inclusion of the town hockey team threw me a bit, because it’s rare to find small-town Americans who care that much about hockey. But even so, her idea is a kitschy and fun extension of the campaign.